Yeah, but: Yeah, they're hard to be excited about. The Long Version: Domke Camera straps come in two main varieties: swivel and non-swivel. Me being me, I own both, which has given me a good opportunity to compare them. While there's also a model that's 1.5" wide, I prefer the 1" wide strap. The centre of the strap is just like the ones on Domke camera bags, being made of heavy canvas with ribbons of rubber woven into one side for grip. The two ends of the strap are nylon that's narrow enough to fit through camera lugs, and split rings and little leather camera protectors are also included for those who need them. 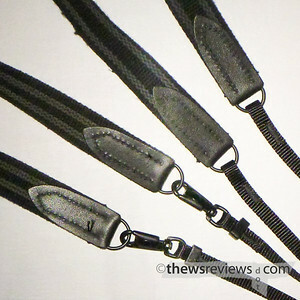 The Domke swivel straps have clips that join the nylon webbing to the wider fabric shoulder section. The idea behind this is to let the camera attach to harness points on vests and backpacks, and it can also be used to tether the camera to a chair or table leg when stopping for lunch. The strap doesn't get twisted around on itself, and it's easy to reverse the fabric so that the 'gripper' rubber can be turned off, as there are times when it can be a little too much. The downside of the swivel strap is that it has swivels on it. They add metal to the middle of the strap, where it can bump against the camera when it's put away. They can make noise, which matters more now that some cameras record video, and I suppose someone somewhere could have a story about one of them coming detached at an inopportune time. 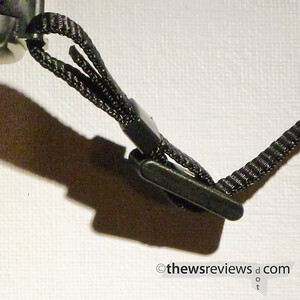 Those potential problems are solved by Domke's non-swivel strap, in which the nylon webbing is sewn directly to the same "D" rings that the swivels would otherwise attach to. 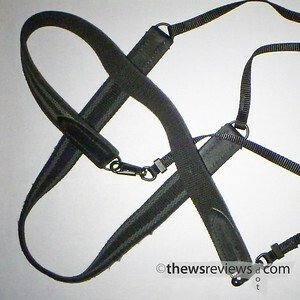 With that exception, the construction of both straps are the same, which is excellent. These straps are classics for a very good reason. If I was to see both styles of strap at my local camera store, I'd almost certainly choose the non-swivel model. But there's really no bad choice here, since both will last a long time, are comfortable to wear, and don't shout out about any particular camera brand. While I prefer my Gordy straps for ones that I normally loop around my wrist, these are my favourite straps for cameras that I typically wear from my shoulder. They're not quite mandatory upgrades for me, but it's very close. Finally, a bonus tip: the way these straps are shipped, with strap doubled back on itself and tucked through the plastic retainer, is simply for convenience. The correct way to attach a camera strap is to run the bitter (which, for all you married people, means 'free' or 'loose') end through the top of the buckle and back down toward the camera, as if the goal is to create a loop out of the webbing instead of a strip. This neatly tucks the end of the strap in between the layers of webbing, and is both aesthetically pleasing and very secure. Nikon has a good illustration of the technique, but it works for all brands.